Just found this. The music is played by one of my faves of late Stefano Montanari and his ensemble. I have wanted to build one and now I will. What's the purpose of the leather pad on the anvil? So as not to make divots in the plates. 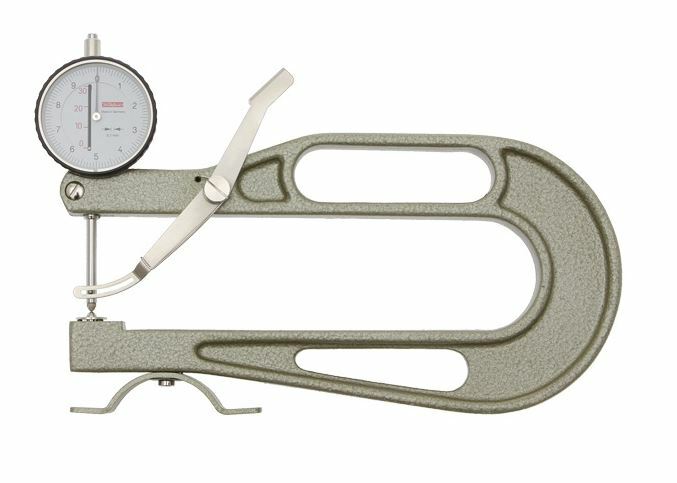 What's the purpose of the tool nowadays, when we have theese, a must have Strad tool? A little maybe, I have asked this before. Unless you are going to massproduce violin plates I do not see why to have one, besides nice to have tool. It could save me 30 min per plate or something. 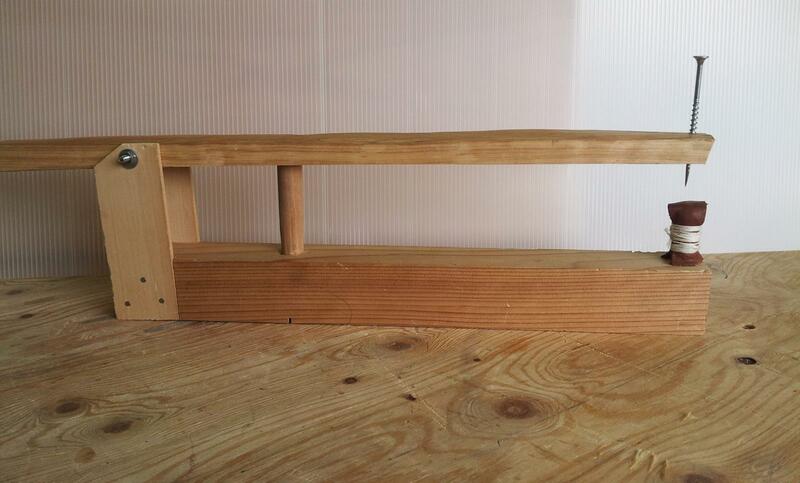 I just think it is useful, foolproof and allows for quick removal of wood without having to measure all the time. Maybe though after making many violins it just becomes instinctive. I am still pretty new to making.
. I am still pretty new to making. I see depth drilling or punching as being worth way more than 30 minutes per plate, mass-produced or not. Do you use a punch or a drill press David ? I have used my drill press as a punch with a nail in the chuck and rounded off dowel jig below the plate. I think it was Don Noon who suggested that. Now I want to build this machine because it looks more elegant. Hi all, and I'm honoured that my video arouse interest on this reputable forum. For me the only purpose in the use of this tool is to look more deeply in the way the "old guys" approach the thickness of the plate. Old hand tool is a joy to use and always teach somethings to genuine hand workers and, as rightly said Rick Hyslop, looks far more elegant than a drill press on your bench!!! Anyway a very efficient tool that worth the effort of making. But I want to revise it. The Morassi proportions are off. 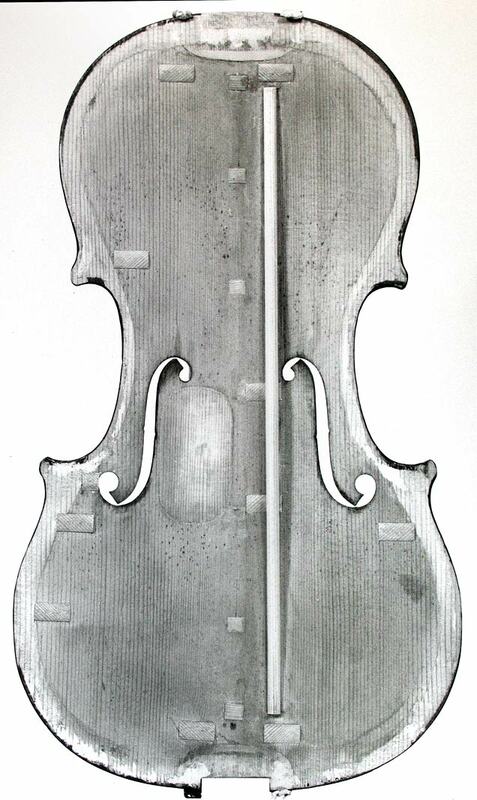 The large notch on the underside of the Stradivari punch was probably for a crossbar. P.S. English and Americans don’t apologize for their bad English, so no need for you to apologize for your good English. I see this tool very useful. Maybe I am slow at the beginning anyway, but this sure must help gettin the wood carved quick. This is now no.1 tool in my list that I have to do preparing for next violins. I should also say welcome to the forum. Thanks for the nice video. I will be building a similar punch in the next few days. P.S As Addie stated you are doing just fine in the English department. David, I started watching your videos on youtube and couldn't stop. Wonderful work. I didn't get them all done, I saved some for later. Thank you so much. From my point of view - absolute bumbling amateur - I could not agree more. Mine is quite "rustic" (come to think of it so are my violins ) but the simplicity and efficiency of the punch cannot be beaten - and it will keep working without electricity! My one regret is that I did not make the punch triangular instead of round. I think this was suggested by Michael Darnton and it makes sense, of course, as there is less surface area in contact with the wood making the punch easier to withdraw. Many thanks for an enjoyable video Davide. I made one to mess around with, but I concieved of it much less formally and differently- Thinking it might be something found in a more rustic shop than Stradivaris. It works quite well if you don't force it. And you can work by transferring inside dimentions to the outside and vise versa. It's hand held not stationary, so you can hold it parallel to any arched surface and drive the point in at 90 degrees to any part of the arch you are indexing off of. With a punch like that, how close to final thickness would you try to get? i'd love to make one of these but the problem i have is finding a treaded screw with the pointy bit! I don't have the facility to turn one. Any idea if you can by a threaded rod with a pointy bit commercially? You could look at post 18 for a ready made solution. OR file a point on a metric threaded screw. The thing I realy like about the punch VS thickness guage (I use both)is the guage can only tell me where I am, the punch tells me where to go. Drill press is nice but it feels like action/feel the gouge and plane suffer,there is a lot of start- stop action that I find disturbing compaired to smooth strokes thru the punch marks. If you have a drillpress and a file, you have what it takes to make one that is accurate enough for the purpose. Failing that, if you can put your hand drill in a vise and lock the trigger, you can file it to shape that way. These both fall under the heading of "the poor man's lathe". With a bit of care, you can file the point up within a few thousandths of an inch of concentricity. That will be better than the tolerance of the frame. I will let you know. I am looking into it right now. 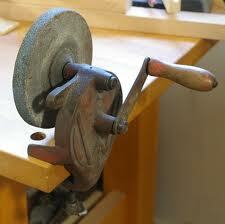 My back up plan is to grind down some threaded metal rod or thread something like an awl. In fact I might just ask Davide what he did now that he is on the forum. If you don’t have a bench grinder, (and maybe don’t have room for one) I would recommend getting an old hand-cranked grinder. A lot of them have small arbors (3/8”) but you can add a bronze bushing to bring it up to modern size... since you’ll probably want to replace the stone. I made the spike from a threaded rod, working the spike on a grinding wheel (the same for tools grinding). Maybe a triangular spike (like M. Darnton suggests) work in a better way but I don't have tried yet and maybe with a truncated point. With my conical spike I must lubricate it with paraffin wax or dry soap (like R. Hargrave suggests) to avoid remaining stuck and lifting the plate. Anyway, if I remember correctly, the original one have a conical shape, but everythings can be improved. thanks Addie for the useful drawings and thanks G. Corazzol for posting the old article of G.B.Morassi of 1981 that I had lost. That year I was a student of Morassi at the Cremona school and one of my friend phisically wrote the text during school hours!!! We also had and we were using a copy of this tool in the school workshop, an enlightening experience for very young students (I was only seventeen.......).